Happy hump day everyone. It's been a while since my last post I have been spending a lot of time researching watercolors, makers etc. Water color is something I have wanted to dabble in for some time and thanks to Jennifer McGuire from Jennifer McGuire Ink I have decided on the brands I think will work best for me. I kept it very simple this week by only coloring in a stamped image from Mark's Finest Papers & Stamps "Welcome Poppies" stamp set. I used the Wink of Stella Clear Glitter for blending. I love how easy the pens blend. I wish you could see the glimmer the flowers actually have. I also want to start using all the chalk I bought a few years back so after coloring the flowers I chalked the yellow background around them. 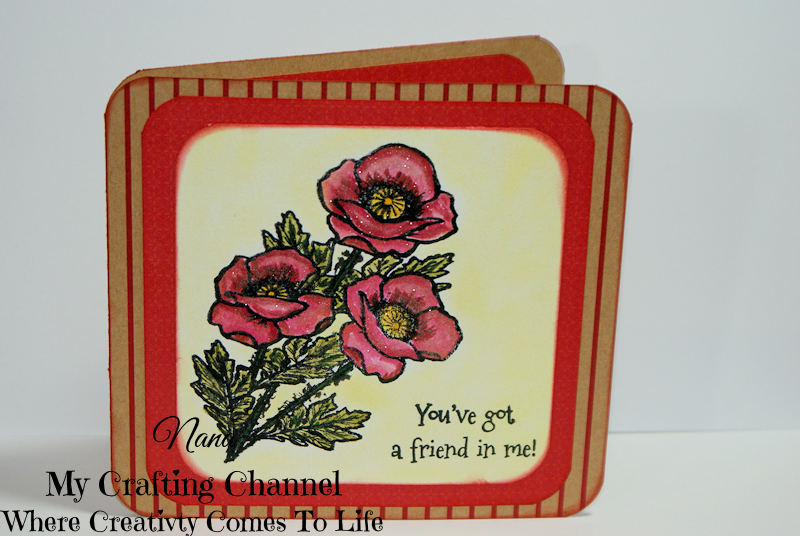 Then stamped the sentiment from Cardz TV "Just Saying stamp set, and layered it all up. Wow Wow Wow. Your flowers came out amazing! I love them! It's me again. I just watched both videos. She makes it look so easy, and it comes out stunning! This is absolutely beautiful! Your flowers look awesome. Looks like you really have the hang of coloring with those new pens. Keep up the good work! On to the videos. WOW!!!!! I LOVE these pens!!!!! Gotta put them on my list! Wonderfully painted the flower looks amazing!! I love it. I love the pretty flowers! !Beautiful card my friend!! Such a pretty card, love the image and your coloring looks amazing! Have a great day! LOVE the water coloring! So PRETTY! WOW This card is awesome!!! Have a great day.